Jenna Kast was a very happy and active girl whose smile would light up a room and whose giggle couldn’t help but make you smile. As the youngest of three children, Jenna never had a problem keeping up with her older brother and sister. Jenna loved to dance, sing, and play soccer and softball. She would always cheer on her brother and sister at all of their sporting events. Jenna enjoyed spending time with her cousins and friends too. She was the happiest when surrounded by friends and family. Jenna was only 3½ years old when she was diagnosed with an ependymoma brain tumor. She fought courageously for 8 years enduring eight brain surgeries, three 6-week rounds of radiation and three clinical trials consisting of different chemotherapy treatments. All the while Jenna never lost her enthusiasm for life. 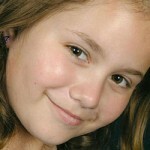 She would continually say, “I know God has a plan for me.” On July 4th, 2010 God called Jenna home. We miss her dearly but continue to feel her presence all around us. Please bless me and make me better. I know You treasure me always. I always know You are with me. I am sorry for anything wrong I have done. I try to do everything to please you. So they may see You and will be blessed. Although healing Jenna’s cancer wasn’t part of God’s plan, Believe in Miracles was and her memory will live on in the hearts of children for years to come. Jenna was our miracle – a special gift from God – who left us memories of a beautiful joyful spirit. She always thought of others and how she could brighten their day. Jenna’s story, her life, has changed the way people see the world. Hers is a story of great faith, great hope and great love. Hers is the story of a Brave Little Soul. You can visit Jenna’s Caring Bridge site for more information.